This page is being dedicated to all the Navy Corpsmen who served in Hotel 2/5 during the Vietnam War. This page is under development and will be expanded as we receive information about our “Docs”. 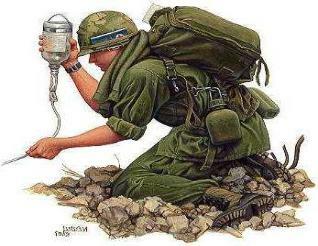 Every combat Marine has heard the cry, “Corpsman Up !!! !” The phrase, “Corpsman Up!” speaks volumes. The name “Corpsman” separates our combat corpsmen from the rest of the Navy; especially if you were an 8404 Fleet Marine Force (FMF) Corpsman. The circumstances varied widely, but the result was a constant. A U.S. Navy Corpsman, wearing the same dirty, torn, and smelly green utilities worn by his Marine brothers and “armed” with his B-1 medical kit, went to the aid of wounded Marines. Usually under enemy fire, these “angels in green” performed lifesaving miracles with complete disregard for their own safety. These FMF (Fleet Marine Force) Corpsmen were something special to us Marines. Although they took their fair share of kidding and good-natured harassment, they were in every sense of the word a fellow combat Marine. They took the same chances, lived in the same mud-filled hole, and ate the same cold C-rations as us Marine grunts. The Marine Corps, the amphibious arm of the U.S. Navy, relies on U.S. Navy corpsmen, nurses, and doctors for medical services. Corpsmen assigned to the Fleet Marine Force (FMF) attend Field Medical Service School before joining combat units. Their training includes familiarization with small arms, basic combat skills, and treatment of combat wounds. When not engaging in a firefight, patching us up or getting blasted with incoming mortars, our corpsmen also provided basic necessities and medical care to civilians around us. Like us combat Marines, our corpsmen also fought heatstroke, malaria, fatigue, rain, leeches, insects, rust, and fungus. They too lived in the dirt, slept in holes they too had to dig that provided some protection from enemy mortars, or slept on the ground, fearfully. They too marched without apparent purpose in chilling northeast monsoon rains, suffered heatstroke with the arrival of the southwest monsoon, pulled leeches from their legs, ate little but field rations, slept little, fungus on their bodies, and fought rust on their weapons. Corpsmen ran more than any other human in the Vietnam War, to get to us when we were hit. A special thank you to all of our corpsmen! You treated most of us and medivaced more of us than you could count. You challenged us to take our salt and malaria pills and constantly nagged us to get our feet and socks dried out. At a young age, you’ve had to witness and experience horrific atrocities that no one should ever have to witness at any age. Without your sacrifice, we may never have returned home but bled-out there in the jungles and rice patties of Vietnam. Thank you for always running to patch us up, giving us a cigarette and a word of encouragement. To all combat corpsmen, “Semper Fi” (Always Faithful) and “Semper Frater” (Always Brothers), we love you! Please leave a comment and the name of your corpsman serving with you. If you have contact information about a corpsman, please contact ltyler@hotel25vv.org and provide him with that information. Thank you. My name is Chester Sobczak ( Chesty), I have left a Comment on another page but I will leave one here also. I served with Doc McNulty from March 1970 to August 1970, that is when I went home. After I was home I received a letter from Sargent McCaulsen that Doc had been Killed, it broke my heart to hear this because of all the good times I had with Doc and how he help me when I was a week from going home how he kept me out because of the jungle rot I had in my leg. Also Jim Tocherman filled me on how Doc got killed he was there when it happened, on the patrol in the village where it happened with Stare and Strips doing a story on booby traps when it happened, Taco told me the story was never written about booby trap. Doc you will be in my heart forever. I too served with Doc McNulty. I was in 3rd platoon Charlie squad. Doc was truly a hero. He was a very caring person who put others needs first. He was always there for everyone with a positive attitude. It was a sad day for all of us when we lost Doc. Corpsman were truly the unsung heroes. Frank did you know Taco Eddie or Tex. We lost Taco and Tex is on his way out with Cancer, he has only 14 to 15 months to live. Your name does not sound familiar, did we know each other. I left Nam before Doc got killed, Sgt. Mac wrote me a letter about Doc. I am sure I speak for all H Co. Docs that serving with our Marines was the highest honor of our lives.